* We have moved premises. ALMOST 50 YEARS OF BEING IN THE INDUSTRIAL SEWING MACHINES INDUSTRY PUSHING BOUNDARIES HAS MADE US EXPERTS IN INDUSTRIAL SEWING MACHINES. 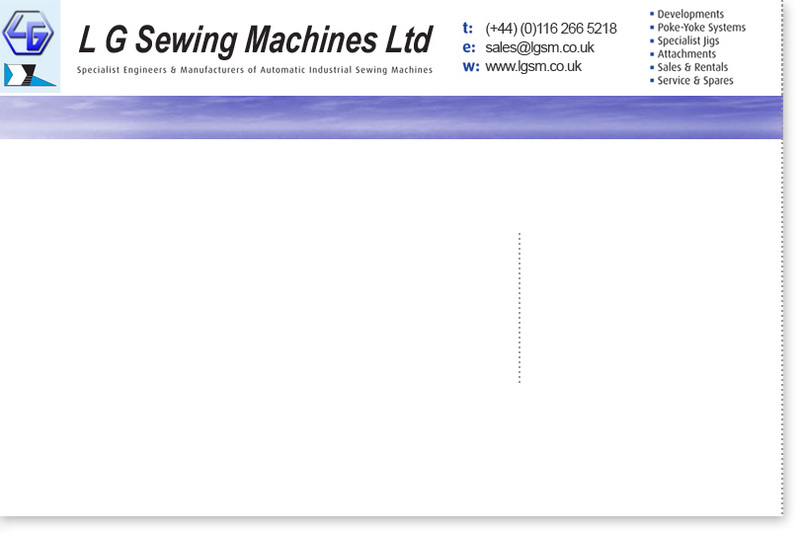 WE CAN PROVIDE YOU WITH INDUSTRIAL SEWING MACHINES FOR ANY SEWING TASK! WE HAVE GREAT WORKING RELATIONS WITH BROTHER, MITSUBISHI, AND PFAFF HAVING WORKED WITH THEIR INDUSTRIAL SEWING MACHINES TEAMS FOR YEARS. NOT ONLY THIS BUT WE CAN MANUFACTURE BESPOKE MACHINES FOR YOUR NEEDS. FURTHERMORE WE ARE THE SOLE UK AGENTS FOR FORSSTROM HIGH FREQUENCY WELDING MACHINES. OUR FRIENDLY STAFF WITH A LIFETIME OF EXPERIENCE AND KNOWLEDGE CAN PROVIDE YOU WITH TAILORED SOLUTIONS AND FREE CONSULTATIVE ADVICE WHETHER IT BE WITH BROTHER, MITSUBISHI, PFAFF, JUKI, SEIKO OR ANY OTHER INDUSTRIAL SEWING MACHINES AND FORSSTROM MACHINES! THEY ARE MULTI – SKILLED TO PROVIDE MAXIMUM FLEXITBILITY, ALLLOWING US TO MEET YOUR DEMANDING SCHEDULES.